Puzzle yourself through the Christmas season! Crypto puzzle games in the advent time have a long tradition. Here are two nice ones of this year’s season. Advent time is crypto puzzle time. 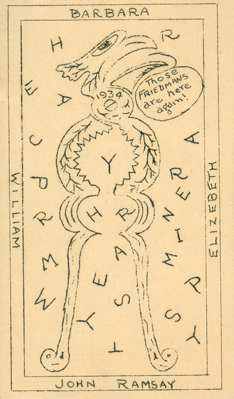 Already in the 1920s, master codebreakers William and Elizebeth Friedman challenged their friends and business partners with cryptologic Christmas cards. Nowadays, advent time crypto challenges take place on the internet. 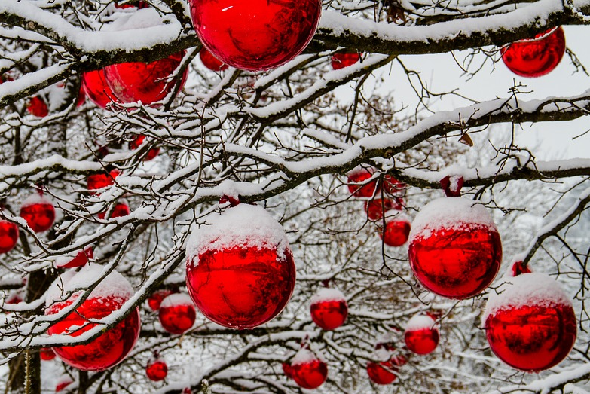 Every year, a few ones are started, usually in early December. I have blogged about crypto games of this kind several times. Now that Christmas 2017 is just around the corner, a few crypto puzzle games have been started again. 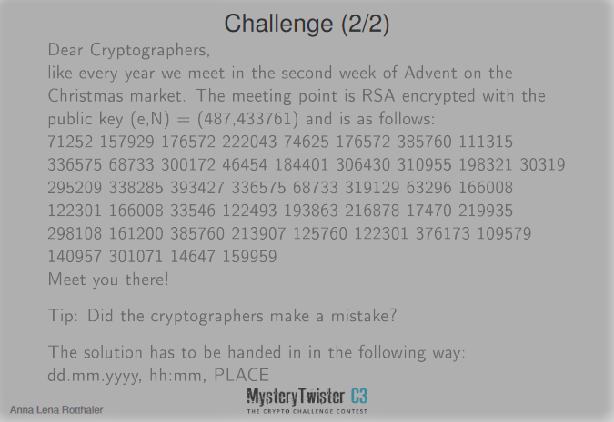 For instance, the crypto challenge portal MysteryTwister C3 (MTC3) is hosting a four-part crypto challenge. 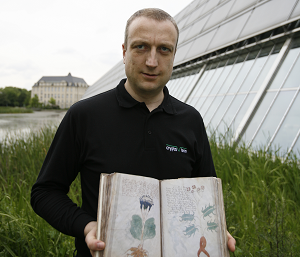 The first two puzzles have already been published, the rest is to follow. Here is part 1. Can you solve it? If so, please don’t publish the solution in the comment section of this post. 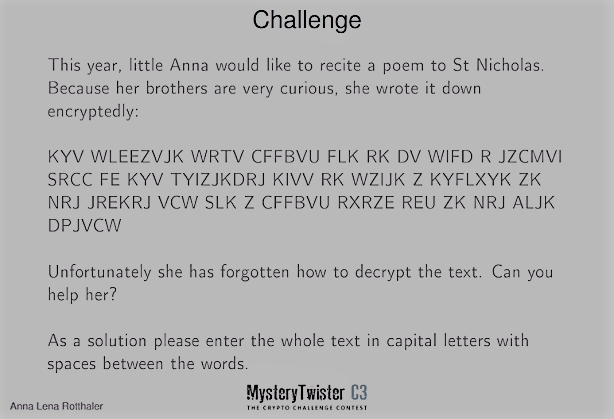 By the way, MysteryTwister C3 is a great website for everybody interested in codebreaking – not only in the advent time. On MysteryTwister C3 you can try your luck on hundreds of encryption challenges in four different classes of difficulty: simple (1), medium (2), hard (3), and unsolved (X). Some of the challenges are designed by me. I mainly contributed level 3 and level X challenges – i.e., some of the tough ones. Beginners should start with the level 1 challenges, of course. You will see that most of them are easy to crack, even for a layman. 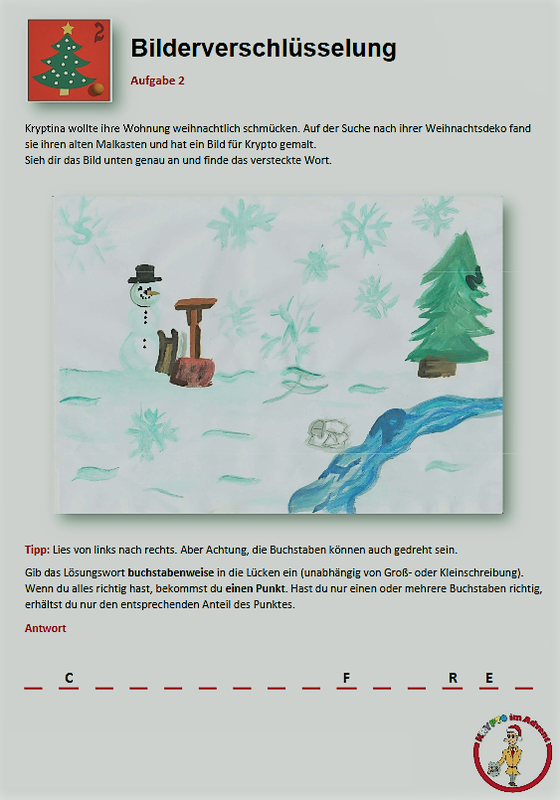 For readers who speak German there is another nice advent time crypto game. It’s named Krypto im Advent. This game provides a new cryptogram every day from December 1-24. It is organised by the Karlsruher IT-Sicherheits-Initiative and the Pädagogische Hochschule Karlsruhe. You have to register to take part. 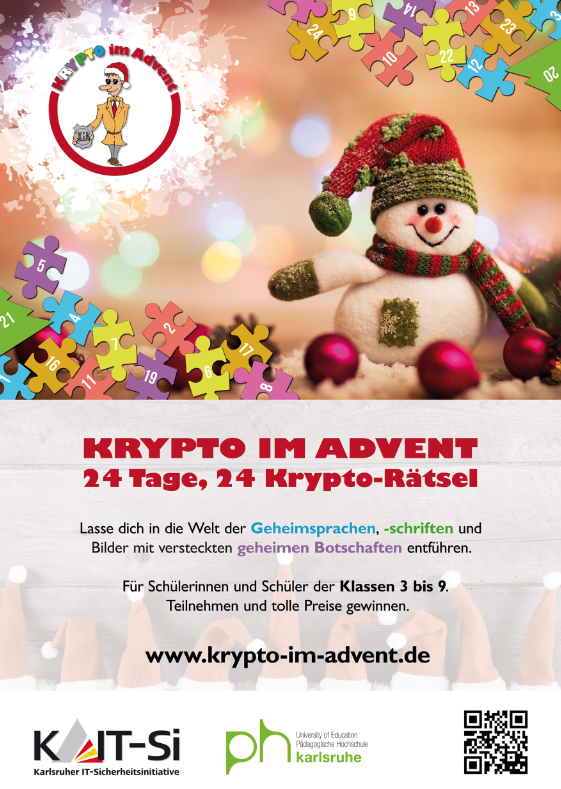 Krypto im Advent provides two categories of crypto puzzles: for beginners and for advanced codebreakers. In both categories there are interesting prizes, for instance, tickets for the south-west German amusement park Europapark. The challenges are very nicely designed. I’m sure, there are more advent crypto games around. If you know one please leave a comment.